This entertaining animated series comes from the minds of those who created Wallace and Gromit plus the equally entertaining Creature Comforts. 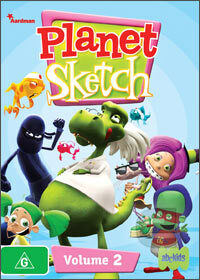 With Planet Sketch Series 2, the creators have truly created some interesting, twisted and colourful characters that children and adults alike will thoroughly enjoy. For the uninitiated, Planet Sketch Series 2 is a collection of skits that star a variety characters such as the diabolical street rappers who are feared in the streets, however when no-one is watching, they like to get involved in games that girls play such as skipping. My favourite characters are the Gnaughty Gnomes who may be innocent ornaments while in the garden and being observed, however if you turn your back, these little creatures come alive and like to play practical games around each other and those around them. Other characters from Series 2 include the two astronauts who are probably the most stupidest men on the planet or the Hypno Poodle who hypnotizes his owners, it's all classic fun. The comedy of Planet Sketch Series 2 may not be as refined as Wallace & Gromit or as outlandish as Creature Comforts, however this series is aimed at the younger market which translates well to this age group. My 11-year old nephew was in stitches thanks to the over the top comedy included in this series and I must admit that there were quite a few gags that made me laugh out loud. Of course where the series does shine is through the wonderful 3D animation techniques which makes this series so endearing and entertaining. Definitely one to investigate.